Adapted from a recipe by David Tanis in the New York Times, April 15, 2016. To make the batter whisk together the buckwheat flour, all-purpose flour, eggs, buttermilk, butter, and salt until uniformly combined. Refrigerate the batter for at least 2 hours, preferably overnight. Heat the butter in a well-seasoned skillet or crepe pan over medium-high heat until foaming subsides. Ladle in about ¼ cup of crepe batter, tilting the pan to spread the batter evenly. 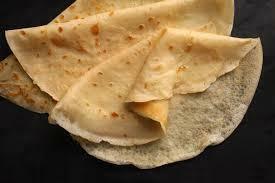 Cook until crepe is browned and crisp, about one minute, then flip and cook one minute more. Stack crepes as they are cooked. Crepes may be prepared in advance and refrigerated, wrapped in plastic wrap, for up to two days. Bring a pot of generously salted water to a boil. Blanch asparagus until just tender and bright green, about 2 to 3 minutes. Remove with tongs, or drain in a colander, and immediately transfer to ice water for 1 minute to stop the cooking process. Spread on a clean kitchen towel to dry. Heat oven to 400°F. To assemble the crepes, lay each crepe flat with the presentation side down. Top with a slice of ham and a generous sprinkle of cheese, and place a few asparagus spears off to one side. Fold crepe in half. Place the filled crepes in a single layer on a baking sheet. Brush with melted butter. Bake until crepe is crisped and cheese is melted, about 5 to 7 minutes.